So, I got Clunker Bumblebee today. Overall I think he's great in both modes. But.. He's REALLY FREAKING DIFFICULT to transform out of car mode. Into car mode isn't too bad, but I feel I'm doing something wrong in reverse. The hood section fitting into between the chest panels is not too bad into car mode after some practice, but out of it feels almost impossible without ripping a wheel or arm off. Also as much as people complained about the roof section on the older one not having a pin? Well, now that it does, I'm SUPER worried about the thin plastic sections that previously weren't stressed as much, but now are due to the pin now causing no give. I feel the figure is really good, but once again, due to fandom crankiness with LITERALLY 0 FORESIGHT, now the figure risks breakage when before it was just a part that could come off if not careful. I'm with Hasbro on this one. I feel HasTak knew why they did it the first way, but just gave in after a buncha people like Baltmatrix decided to **** on it for fun. Anyhoo, overall, this guy looks amazing in either mode. He feels MUCH chunkier in mass than previous movie lines. I only have SS Jazz as another SS deluxe to compare him to, and I just remember how terrible the AoE line was for example, and am just so happy we finally have more complex and WEIGHTIER movie figures. I don't want large and hallow, I want smaller and weightier, and that's what these are. Really well done, despite the difficult areas.Plus the rust paint aps look really good. Both modes hold together very well also. Just.. very difficult to get him out of car mode. UnderYourCloset wrote: So, I got Clunker Bumblebee today. Overall I think he's great in both modes. But.. He's REALLY FREAKING DIFFICULT to transform out of car mode. Into car mode isn't too bad, but I feel I'm doing something wrong in reverse. The hood section fitting into between the chest panels is not too bad into car mode after some practice, but out of it feels almost impossible without ripping a wheel or arm off. Also as much as people complained about the roof section on the older one not having a pin? Well, now that it does, I'm SUPER worried about the thin plastic sections that previously weren't stressed as much, but now are due to the pin now causing no give. I feel the figure is really good, but once again, due to fandom crankiness with LITERALLY 0 FORESIGHT, now the figure risks breakage when before it was just a part that could come off if not careful. I'm with Hasbro on this one. I feel HasTak knew why they did it the first way, but just gave in after a buncha people like Baltmatrix decided to **** on it for fun. He's actually really great, and after just watching Emgo's transformation I feel I have a.. bit easier of a time transforming him now? But yeah, I feel sometimes Transformers would be better without half the fanbase tbh. Also people like Baltmatrix jumping on YouTube immediately for views and calling it **** just because he didn't take enough time with it don't help at all. This is one well-designed figure. My only problem is the arm that the cannon goes on is very easy to knock off, so it's kind of inevitable for it to come off on the way back to robot mode. But do I go on YouTube and put a poo emoji on his head for clickbait? No! Lord, this fanbase is... well.. full of a lot of big children, which I guess sorta makes sense. Still though! But I digress. Studio Series, though the figures have had some issues at times, has been really good to me so far. This Bee is good. I just need to be SUPER careful with the roof section to avoid breaking it at the very thin clear plastic connections. X_X I bet this Bee will look amazing with BBB movie Optimus though (who, as I've said, I have preodered.) I also just feel SS just has better proportions many times than Siege, so I would take the SS 38 Optimus over the Siege one any day just because he looks more dynamic to me. I don't recall the AoE line being terrible. I liked the yellow 'ninja' Bumblebee (never got the black one as the robot mode didn't seem as cool), Drift, Crosshairs, Voyager Grimlock (not the leader), Slug, Strafe, I quite liked Galvatron despite the shellforming and of course the Evasion Mode Optimus Prime was a very well received figure. My only real issue with the AoE line was how hard it was to actually find in stores. Most places (at least in the UK) only stocked the simpler gimmicky kid's lines and not the proper figures. Toys R Us was only place i could find that stocked the Deluxes and Voyagers and Argos had the Leaders. I certainly bought and enjoyed more figures from that than any non-movie line of past decade or so. Depending when you got yours it may be one of the later releases that fixed it, or you might have just got lucky. And in regards to the arm post, just apply a bit of nail polish for any loose attachments or floppy joints. Even on joints that aren't particularly floppy but may need a bit more stiffness (like SS32 Optimus Prime's arms are perfectly fine for lifting up his own weapons but lifting up the huge cannon made from Jetfire's top half required some extra strengthening of the elbow joint). I use the stuff on a lot of non-Transformers figures too, especially ones you find at car boot sales and charity shops all super floppy. Last edited by Carnivius_Prime on Mon Mar 04, 2019 5:41 am, edited 1 time in total. Motto: "All we need is a little Energon, and a lot of luck!" Count me as another one disappointed by the SS Deluxe Barricade. I was excited for it, but sadly it's a let down for me. In other news I received my Leader Megs and Jetfire from Hasbro Pulse. They both look fantastic in robot mode - and I haven't transformed them yet. Excited to though! Also - I can't believe Shatter/Cogman/etc are already hitting stores! I need them to hit some etailers! Carnivius_Prime wrote: Depending when you got yours it may be one of the later releases that fixed it, or you might have just got lucky. 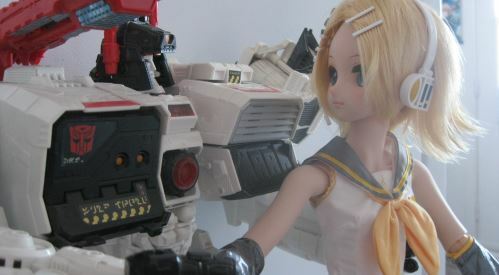 And in regards to the arm post, just apply a bit of nail polish for any loose attachments or floppy joints. Even on joints that aren't particularly floppy but may need a bit more stiffness (like SS32 Optimus Prime's arms are perfectly fine for lifting up his own weapons but lifting up the huge cannon made from Jetfire's top half required some extra strengthening of the elbow joint). I use the stuff on a lot of non-Transformers figures too, especially ones you find at car boot sales and charity shops all super floppy. I just use superglue. Pop the joint apart, dab a tiny bit on with a toothpick, let it dry, then permanent fix. I have floor polish but that stuff always rubs off so fast. Superglue never rubs off, and works just as well. And doesn't feel rubbery during movement either. It's stiff but also doesn't damage plastic too much when you just put a tiny bit on. This only works perfectly though for joints you can pop apart. However I've found it's still the only way I can tighten unremovable joints because floor polish just immediately comes off. If possible, get the joint apart first because it's much cleaner and less scary, but otherwise just dab a tiny bit of liquid superglue in and then move the joint constantly while it dries. I did this to Skullcruncher's hip joints, and although it looks a bit sandy up close, it feels amazing. Very sturdy. UnderYourCloset wrote: I just use superglue. Pop the joint apart, dab a tiny bit on with a toothpick, let it dry, then permanent fix. I have floor polish but that stuff always rubs off so fast. Superglue never rubs off, and works just as well. And doesn't feel rubbery during movement either. It's stiff but also doesn't damage plastic too much when you just put a tiny bit on. This only works perfectly though for joints you can pop apart. However I've found it's still the only way I can tighten unremovable joints because floor polish just immediately comes off. If possible, get the joint apart first because it's much cleaner and less scary, but otherwise just dab a tiny bit of liquid superglue in and then move the joint constantly while it dries. I did this to Skullcruncher's hip joints, and although it looks a bit sandy up close, it feels amazing. Very sturdy. Yeah I used to use superglue. 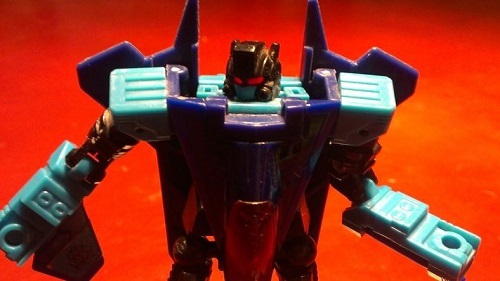 Until an unfortunate accident with Takara Legends Blurr's stupid antenna that wouldn't stay extended. Put me right off. Also it can get a bit messy (somehow stuck one of RTS Tracks' guns to my arm when I was applying glue to his annoyingly loose feet). I may still use superglue for anything that really needs it but for general stuff the nail polish has been fine and lasted long time too. I stay the hell away from superglue as well. The chances of **** it up are just too high for me. william-james88 wrote: I stay the hell away from superglue as well. The chances of **** it up are just too high for me. Well for me the trick is to just use a toothpick and try to only do it on stuff that's able to come apart. It's not bad when you actually know what you're doing. I've made some bad screwups with superglue in the past, but that was before I started using toothpicks. It also works extremely well for thickening areas that are too easy to come apart. My X-Transbots Crackup (Breakdown) has these car panels on his legs that are on a pin, and only hold there with friction. I used a tiny bit of superglue on a toothpick to tighten the lip a bit, and now it holds together even better than if the plastic was thick enough, because superglue is much stronger than most plastics which wear down over time. I just drip a little bit of superglue on a paper plate and then use the toothpick in that, I don't drip it on the toothpick directly. Also X-acto knives are your friend. I have some that are retractable and have round blades instead of straight like a regular X-acto, and I had to use those with my SS Blackout when I first got him because some joints wouldn't budge. Sometimes with these new figures there are areas that just have a bit too much plastic, so you gotta shave them down. Especially on larger things in like Studio Series which have very complex mold designs. He does look amazing. I wasn't expecting a good alt mode anyway. I mean movie Jetfire is kind of traditionally bad in alt mode, but that is one really well-done robot mode! Right so after some more play with Clunker Bumblebee, he's actually getting easier to transform. Just gotta position my hands right. Those legs are hard to remember how to do, but these kind of complex transformations are what I live for! I love this lil' guy! Super excited to see how 38 Optimus looks with him! Until i get Prime, I'm not sure if I will combine them for the shelf. They will get combined, but I have the original leaders, so I don't feel like I need to combine them, and it would be really cool to have Jetfire in this pose on my movie shelf with a good voyager OG looking Prime. 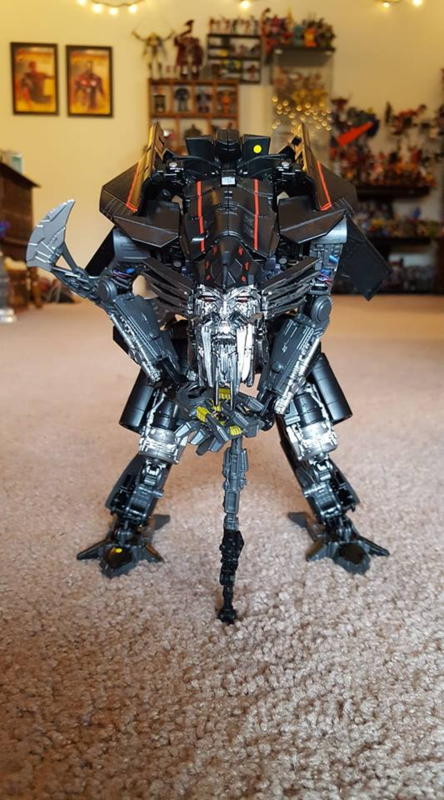 I wont be getting prime till the DOTM leader comes out, so it wont be for a while. Thats ok, because I havent found Jetfire either. See, I'm glad that the leader Prime interacts with Jetfire, I am. It is so cool for everyone who wants a Prime and he is so multifunctional. But to me, I want one by itself, a good voyager of the OG design to go with my AoE Evasion mode and TLK voyagers, and I want one with flight tech. And there are so many options for them to combine and weapon up, it's fantastic. I am also so tickled pink with the trailer weapons ring, including the axe. that is awesome!!!! Can confirm. Lost a Reveal the Shield Bumblebee to superglue trying to tighten the shoulder joint. Nail glue is just as bad. Used it on a rare campaign Arms Micron (fragile little buggers). BIGGEST mistake ever.